Weighs and mixes up to 16 dry and liquid confectionery ingredients into a homogeneous slurry. Individual ingredients are fed via a weigh hopper into the mixer and mixed during the fill cycle to produce a consistent slurry. Batches are fed from the Autofeed mixing tank to two reservoir tanks to facilitate a continuous feed to the cooker. Firstly, sugar slurry is dissolved and partially cooked in a plate heat exchanger. Secondly, cooking to final moisture takes place in the Microfilm™ rotor. This creates a thin film of syrup which cooks rapidly without process inversion or burning of dairy ingredients. Incorporates colours and flavours into the cooked syrup via a gravity split feed system. 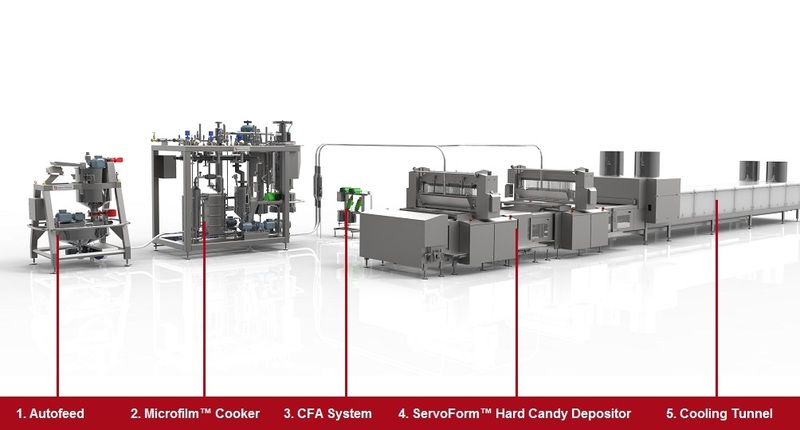 Each colouring and flavouring system is specified to match the level of automation required by the customer and the characteristics of the depositing system. Continuously deposits syrup at final moisture into solid moulds using a starch-free process. The one-shot depositing action can combine up to four colours and components in a single product to produce a wide range of attractive candies that have exciting taste and texture combinations. 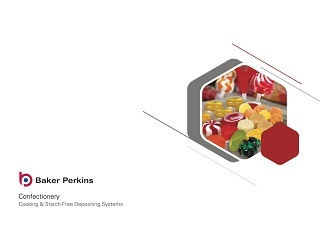 Baker Perkins’ ServoForm™ depositor platforms enable the production of hard candies that can be positioned as a healthy alternative to snacks or conventional confectionery, or used to improve profitability within the healthcare market. 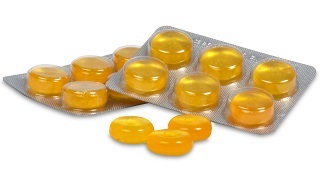 Some medicated products are more suitable to a hard candy delivery system, particularly where slow release of the active ingredient is required. These include antiseptics, menthol and eucalyptus oil to alleviate the symptoms of minor ailments such as coughs, colds, sore throats and nasal congestion. Medicated, enriched or fortified confectionery products can be manufactured in low-sugar or sugar-free formats, with no more than 1% fat. Baker Perkins' technology is suitable for products containing ingredients such as vitamins, minerals, fibre and energy supplements. Healthcare positioning may be further enhanced by including fruit paste, juice or pieces. Real fruit juice can be added as a centre filling. The hygienic nature of the ServoForm™ processes makes them ideal for production to validation standards for healthcare products. The system is particularly suitable for products where validation of the process is required. The ServoForm™ platforms offer a complete cooking, depositing and finishing process for healthcare products, based on continuous depositing at final solids into reusable moulds. The one-shot depositing action can combine up to four colours and components in a single piece to produce a wide range of attractive candies that have exciting taste and texture combinations. Multi-colour, multi-component candies can be produced in stripes, layers and random patterns. Hard or soft centre-fills can be incorporated, with every possible colour and flavour. Superior appearance, high clarity and rapid flavour release with a smooth 'mouth feel' are some of the key quality advantages created by depositing compared with die forming. The nature of the depositing process creates complete control throughout the system, leading to extremely high dimensional, shape and weight accuracy, negligible scrap rates and efficient wrapping, plus maximum hygiene with low maintenance. 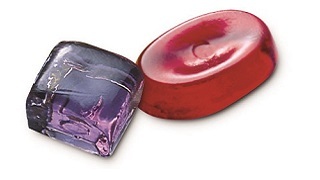 View some of the hard candy products that can be made on Baker Perkins' process lines. 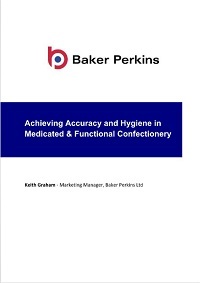 View some of the functional and medicated confectionery that can be made on Baker Perkins' process lines.